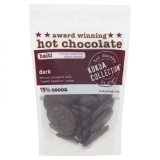 This 32% drinking chocolate powder is the latest addition to the Kokoa Collection range of single origin hot chocolates. 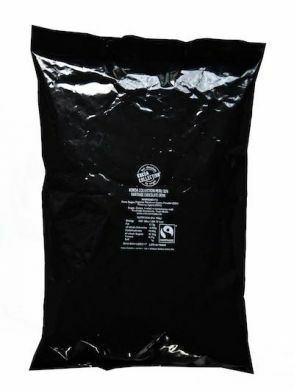 Specially sourced with Fairtrade and Organic cocoa beans. The balance of cocoa powder to sugar is perfect at 32% so as not too sweet but really not too dark either, just a good all round delicious drinking chocolate that will be loved by everyone. Can also be used as a base for mochas, a dusting for cappuccinos and for cold beverages such as frozen hot chocolate, iced chocolate and milkshakes. This is a catering size foil bag so you will need to find measuring scoops and a container to store in. Prepare a paste by mixing cocoa powder and hot water. Add a small amount of hot textured milk, stir, top up with the milk. Use 20 grams for 8oz. Use 28 grams for 12oz. Use 36 grams for 16oz. Approx 50 x 8oz servings. cane sugar, fairtrade cocoa powder (32%), flowing agent (E551), sugar, cocoa: traded in compliance with fairtrade standards, total 99.3%.